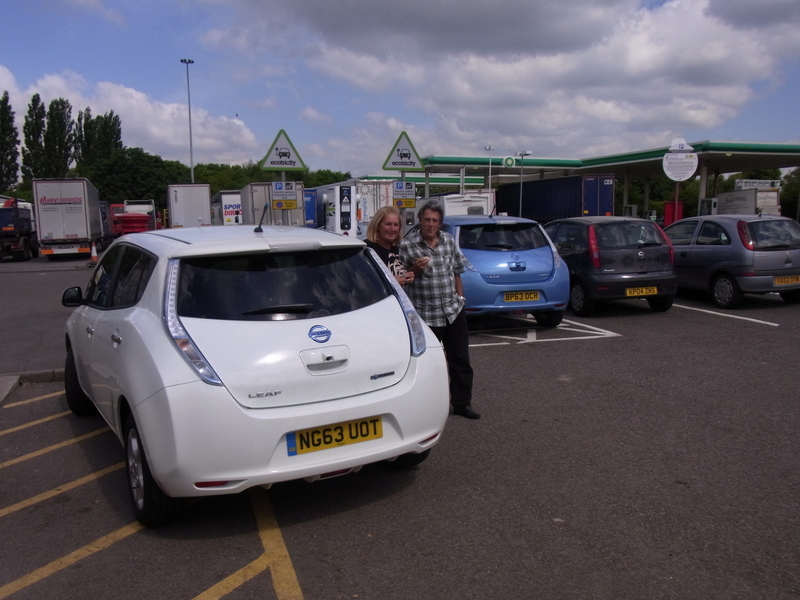 Last week’s trip to the Formula E testing session at Donington Park gave me a chance to try some longer-distance travel in the Leaf. Travelling alone I could take my time, and maybe take some small risks with charging, without howls of protest from the family. So it was that I set off from home near Salisbury just before 08.00 on Wednesday 9th July for the journey north. First stop was at Oxford services, at the junction between the A34 and A44. I poured myself a coffee and sat in the sunshine while the Ecotricity charger worked its magic. I needed just one further stop at Watford Gap on the M1 (Ecotricity again), which was pleasurably extended by chatting to a retired couple from South Shields. It turned out that they’re participating in the technical trials of the My Electric Avenue project, so for £100 a month they can travel the length and breadth of the country if they have the patience. Between us we agreed that journeys involving more than one rapid charge are practical only if time is of no consequence. In a Leaf that means no more than 140 miles or so. If time is of the essence and money is no object why not buy a Tesla Model S? Suitably refuelled I set off again and reached Donington Park around noon with about 30 miles remaining range. After a thoroughly enjoyable afternoon (see Testing times for Formula E teams) I set off with a friend to find a pub for a quick drink. Ignoring the advice of the Leaf’s navigation system, we followed brown tourist signs for seven or eight miles only to find that the much-heralded Queen’s Head was closed until further notice! The Leaf then took us to a pub that was actually open. I needed to return to Donington Park services for another Ecotricity-powered charge, and arrived there all but empty to find – to my surprise and delight – a Tesla Model S occupying the Ecotricity charger. The couple driving it were taking pictures for some unspecified promotional activity but they did need a charge so I didn’t get connected until 8.30 and left the services just after 9pm. This was going to be a long evening. Watford Gap was too early for a stop on the way back, so I sailed past with no very clear idea where the next charging point would be. The Leaf’s navigation system wasn’t very reassuring so I pulled into Northampton Services with some trepidation. Sure enough, another Ecotricity charger hove into view. The firm’s strategy of equipping service stations on motorways and trunk routes is working well, now that the network has grown to the point where you can be almost as sure of finding a rapid charger as a petrol pump. 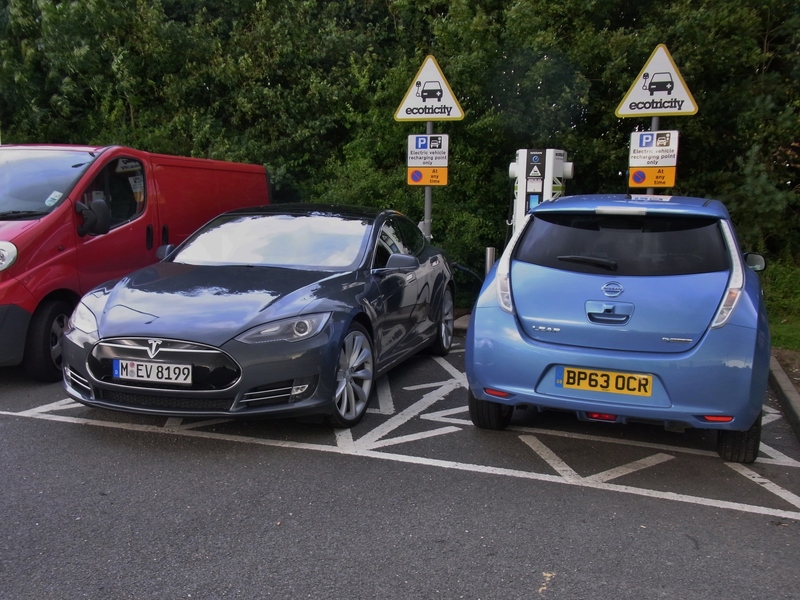 Having checked the Ecotricity web site before leaving home (I do think ahead sometimes) I believed the charger at Chieveley Services to be out of action, so I stopped again at Oxford. At the end of the charging session the battery temperature display was just below the red section, but it stayed there for the rest of the journey without going any higher. Continuing south at my usual indicated 70mph, it began to look unlikely that I would reach Rownhams Services on the M27. The alternative was a drive up the M3 to Winchester Services which, though safer, added about 40 miles to the journey because I had to carry on to Basingstoke to turn round. Doh! I was thankful that the family wasn’t with me to enjoy this little excursion, because I finally rolled home at 02.15. A long drive, certainly, but curiously satisfying. 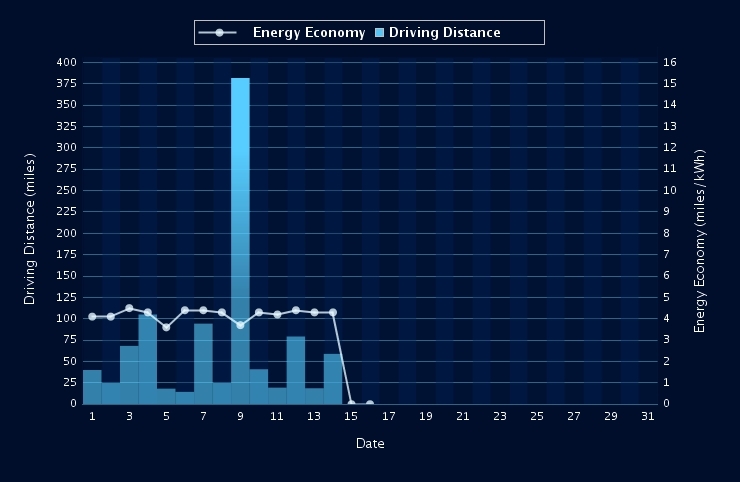 The day stands out in the monthly Carwings report, not just for the distance covered but because energy consumption dipped from its recent level of 4.3 miles per kWh to 3.7. I’ve noted before that higher speeds have a more pronounced effect on consumption than you’d notice in an ICE car; I think that’s partly because the latter becomes grossly inefficient in heavy traffic, where the EV is in its element. The experience will be useful for future reference. Knowing, for example, that I can comfortably reach Oxford Services from home will make the next family trip to see friends at Milton Keynes a more relaxed affair. Would I do it again? Of course!